…when a couple got married it was the first time either of them had left home. The gift list was a way that newly-weds could be fairly certain of obtaining a supply of crockery, cutlery and bed linen to their taste for their marital home. Nowadays people will generally have had their own property and possessions prior to getting married and, unless they’ve lived together for some time before getting married, are far more likely to find that they have two of everything. The last thing they want is several more toasters. A gift list is useful but make sure your guests are aware that it’s not mandatory. It’s great for listing specific items from a chosen supplier, but an individual present chosen with special care will be just as precious. And don’t be afraid to ask for some expensive things – people are (often mind-blowingly) generous and will often club together to purchase larger items. Plant some trees: a lasting reminder of the couple’s special day, which helps the environment too. There are organisations which will plant trees world-wide, or for one closer to home visit www.nationalforest.org. Sponsor a child in a third-world country, or an animal: again there is a wide range of charities to choose from, both internationally and in the UK. A contribution towards Save the Children, UNICEF, WWF or a similar organisation might be a much-appreciated wedding gift. Weddings are an expensive business, so a gift such as vouchers towards the photographer, the cake or a wedding video is becoming popular: and guests can donate as much or as little as they wish or can afford. All of MamaCakes’ ‘friends’ will be happy to discuss this with you. Likewise one couple we know asked, by way of an insert in their invitation, only for contributions towards their honeymoon. If you want to give something longer-lasting and more decorative, then what about vouchers towards having the dress framed (see our last blogpost, The wedding dress life after the big day. And finally, one we particularly loved. Ten friends clubbed together to buy a couple who had got married after fifteen years together…. matching toasters! 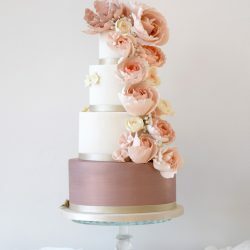 …featuring latest trends, inspiration, ideas and useful cake tips and wedding planning advice.